On a deep blue day, as the dawn began to approach, little Ruby awoke to an empty house. There was no waft of tuna in the air to fill her nose. There was no blair of music nor crackle of television, nor even a hint of sizzling bacon to perk her ears. There was only silence, and a stale smell of burned rubber. Something was wrong. She was alone. Help this poor lost kitten traverse across great obstacles, battle against vicious creatures, and discover what happened to her owner. This is a Platform/Arcade game entry for the MAGS June 2011 competition. "Though rough around the edges, Kitten Adventures shows some promise, with a decent grasp of platform design, and a number of interesting ideas." Great and quite long kitten platformer that's a little rough around the edges due to its MAGS origins. Varied locations, enemies and the possibility to devastate your master's apartment in an absolutely cute manner. 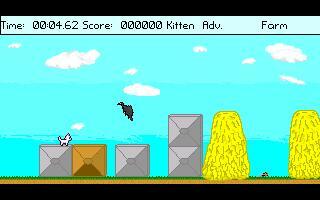 A nice and hard platformer with a kitty! The dev. choices are quite interesting and the action smooth and addictive. Thumbs up!